Old Glory will not be flying in front of my home this weekend, but not for the reasons you might think. Typically, my family likes to show our patriotism and when we moved to our new home a few years ago, high on the to-do list was installing a new flag pole mount on our front porch. President Obama was in office then, and I was encouraged with the direction our country was heading. Even as things have deteriorated with America’s current leadership, we usually display our flag. It’s easy to feel patriotic where I live in Pennsylvania, there is history steeped all over the place! 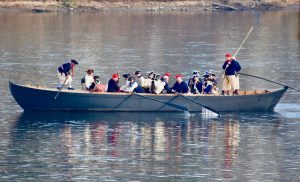 George Washington crossed the Delaware about twelve miles from my house. Many homes display lit candles in their windows as a welcome sign, just like the patriots did in the 18th century. The street I drive on daily is named after the Durham boats that took the soldiers across the Delaware River on a frosty Christmas evening back in 1776. News of Washington’s initiative raised the spirits of the American colonists, who previously feared that the Continental Army was incapable of victory. This event was pivotal, and the energy of those hardworking, farming folks still exists here in our air. About a week ago we learned that a beautiful robin bird had set up camp in one of our rose bush topiaries, right in front of our home’s entrance and behind the column where we hang our flag. 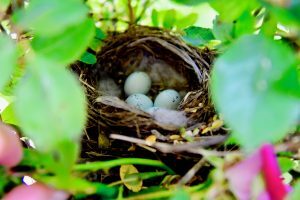 Her exquisite nest cradles four gorgeous, tiny spotted blue eggs. 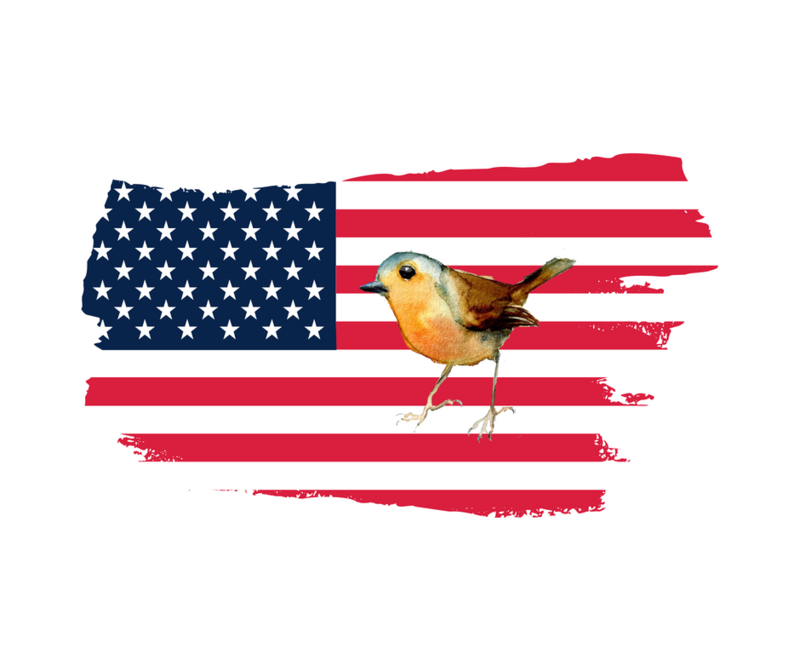 These squatters are welcome metaphors, and if we have to forgo our outward expressions of patriotism to make sure that this sweet bird family stays intact, that is the sacrifice we will make. Old Glory will have to take a sabbatical. This robin’s family is now part of ours. We no longer use our front door because we don’t want to freak out the mamma, and we don’t want to disturb the soon-to-be newborns either. Of course we went to our local garden store to purchase way too expensive bird feed specifically formulated for MidAtlantic robins. We have directed all deliveries to go to the garage and short of setting up a sea turtle protection fence around the nature site, we are all invested in these little ones hatching, living and thriving. They are our future. Love it! Love you! We are one big family and patriotism is showing respect and justice for all. Thank you for doing it in a most beautiful way Grace Ann! So worthy of tweeting! From one gracious family to another! You Phoebe are amazing! Put a BIRD on it! XOXO!